Guess the cable length to win stickers! An HP 3312A function generator is connected to an Agilent DSO1014A oscilloscope via a length of coaxial cable. The function generator is set to generate a square wave of frequency 1MHz. Based on the screen capture below, what is the length of the coax cable? gets some free stickers as a reward! The coax is labeled RG58A/U. The input impedance of the DSO1014A is nominally 1MΩ + 18pF. In case it’s not obvious, the scope photo shows two curves. The bottom curve is a zoomed in version of the top one, showing the rising edge only. This means that the time per division for the bottom curve is different from the top curve. Thankfully, Agilent shows the time/div at the bottom of each so you don’t have to guess! The function generator claims to have an output impedance of 50Ω. Is this true? Can you make a rough estimate of what the actual output impedance is, based on the screen capture above? Note: Random guessing is not allowed. Please show that you made some honest attempt to solve the problem, even if it is by unconventional means! We have a winner! At 4:20pm, macegr posted the correct answer – 25 feet! More precisely, I measured the cable to be 297 inches long, including 1/2 the length of the each BNC connector. Garrett, if you want to claim your stickers, e-mail me your snail mail address! Two other people arrived at the same answer slightly later in the day: anonymous, who eventually came up with 7.92m (26 feet) at 5:25pm, and SiliconFarmer, who stated 26 feet at 7:22pm and then second guessed himself with an incorrect number of 30.5 feet, outside of the 10% allowable tolerance (always stick to your first guess!). The double bump in the bottom curve is indeed due to reflection on the line, as macegr pointed out. The first big rise in voltage at the center of the curve is due to the incident pulse from the function generator arriving at the scope. The scope, which is not terminating the line in it’s characteristic impedance (50 Ohms) but rather looks like an open circuit, reflects almost the entire pulse back down the cable. The function generator is also not quite a 50 ohm match, so some of that reflection is reflected AGAIN back down the line towards the scope, causing the second rise 80ns later. Since two reflections (and two trips down the cable) are involved, the delay is 2x the actual time it takes for the signal to travel one way down the cable. Solving for the distance is just a matter of calculating the velocity of the signal down the coax times the delay between the two discreet jumps in voltage in the curve, and then dividing the result by 2 to give the one way distance of the cable. The velocity of an electrical signal on the cable is the velocity factor of the cable times the speed of light. The velocity factor for RG58A/U is around 0.65, which can be a table lookup (as I think pretty much everyone did) or calculated directly as 1/sqrt(er) where er is the relative permittivity of the coax’s dielectric, polyethylene in this case, which is around 2.3-2.4. This yields 80ns (4 divisions times 20ns) times 3×10^8 m/s(the speed of light) divided by the square root of 2.4. We convert the result, 15.5 meters, to imperial units. This gives us approximately 51 feet, which we then divide by 2 to get 25.6 feet as the answer (307 inches), which is well within 10% of the correct answer of 297 inches. This brings us to part 2, the extra credit. anonymous gave an estimate for the function generator impedance of 67 ohms, pretty close to my own estimate of 62 ohms. I solved this by looking at the relative size of the second jump in voltage, ~0.4V, compared to the first jump, about 3.6V. This ratio is about 0.11. Solving for the reflection coefficient of the function generator, p=(Zs-Zo)/(Zs+Zo), where Zo is the characteristic impedance of the cable, or 50 Ohms, yields approx 62 Ohms, not far from 67 (less than 10% error). anonymous, for correctly answering part 2, you are also entitled to stickers, contact me to claim your reward! Nice work guys, I am really impressed by how quickly you solved this and how many of you were on the right track within hours of my posting the challenge. Great job and congratulations macegr and anonymous! I see others have gone the same direction I was thinking. There is an impedance mismatch, so we can calculate the cable length from the difference in time from the incident wave to the returning reflection. Looks like 80nS, so one way is 40nS. 0.66 * 186282 miles/sec * 40nS = 0.0049178 miles = 26 feet. But macegr had that already. So I’m going to assume the velocity factor is higher. If it were at the upper end of RG58 cable speeds, it would be 0.85, which gives 33 feet. and count on the +/- 10% to cover anything from 27.5 up to 33.5 feet, which should cover the range allowed by the velocity factors of RG58 coax. Well, it’s been years since I ever considered this type of thing, but I’ve convinced myself that double jump is the result of a cable reflection. Looks like there’s about 80 nanoseconds between the edges. Velocity factor of RG58A/U is 0.659, 194-million-odd meters per second, converts to 0.639 feet per nanosecond. So if that really is a reflection, we’ve got a roundtrip path of 0.639 * 80 = 51.12 feet, let’s call it a 25 foot cable. Hopefully I’m not so far off that I’ve embarrassed myself as an engineer for all time, but I haven’t glanced at transmission lines since 2001. I see some very good attempts, but no correct answers. I added a 3rd hint to the original post that might help. Cable lenght with the dso connected at the end of the cable. My uneducated guess is that yours is solid PE and your cable is 0.528 m lenght. Well, obviously the 1/3 I used it’s wrong since you are doing the meassurement at the dso where the reference is, so the pulse reflection travel is just 2 cables length and not 3 as will be if the meassurement were done at the generator. And the cable length guess should be 0.792 m for solid PE. Alright, then if the time per division is 20ns in the lower trace, the time difference is 80ns and the cable lengths are just 10x the previous ones obtained with 8ns. And the cable length guess should be 7.92 m for solid PE. And as bonus, your signal generator INPUT impedance should be arround 8/6 of that of the coaxial cable that you are using. That is arround 67 Ohm for a 50 Ohm cable. To get that figure just throw in the 7 and 8 divisions at the transmitted wave formula of the agilent pdf or the 7 incident and 1 reflected of the solved equation for Zb and gives you the mismatching impedance. 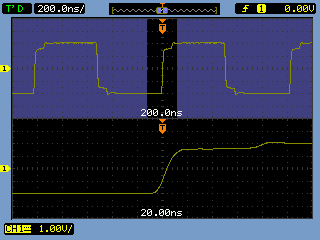 According to the spec, RG58A/u has a nominal delay of 1.54 ns/ft. To add to my previously horrible calculation, how about I remove the 18pf from the input impedance, leaving a length of 7 feet. I like to be precise, but I could care less about accuracy. Random guessing is not allowed. I hate to make such a rule, but if someone guesses the correct answer without making an attempt to reason through the problem, it will take the fun away from people who want to actually solve it.